Every dog owner knows that his or her pet has its own personality, and what better way to complement this than by matching it with a cool collar? The following list covers every style of collar out there, from inexpensive, cute ones for your English Terrier to some very mean attire fit for a pitbull. This will make it easy for you to choose the right one, without going through the hassle of visiting your local pet shops. 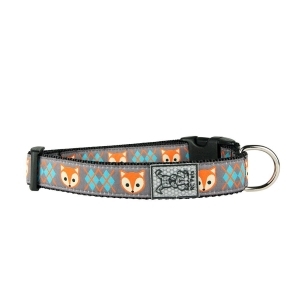 These affordable clip collars from RC Pet Products offer a wide range of colors and patterns, firmly leaning towards the “cute and colorful” side of graphic design. On top of that, it is very convenient, with a regular clip being used, like you would find in backpacks, instead of a buckle. This doesn’t mean that you’ll have fewer possibilities for adjusting it, and the medium sized 1-inch wide model can fit neck sizes between 12 and 20 inches. To increase your dog’s safety at night, the manufacturer’s brand had been inscribed with reflective paint lettering. This one’s a classic, and you really can’t go wrong with classics, especially if they’re made from high quality, soft Cumberland Leather, and nickel-plated metal. 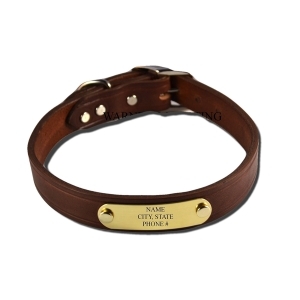 It also features a tag for the dog’s name and your phone number or address which Warner Manufacturing promises to engrave for free. It comes in a variety of sizes that would fit between 13” and 25” of neck circumference and the buckle allows for 4” of adjustment. It is meant for medium to large sized dogs, and users report that it’s tough enough to be used for farm or hunting dogs. This is a soft and comfortable canvas piece that also comes with a pre-tied bowtie to give your pet a stylish British look. It might not make the perfect fit for a German Shepherd or Doberman, but it should go well on a medium to small terrier. This collar closes with a clip, but you can still adjust it via a plastic ring, and there are a number of sizes to choose from, so the manufacturer doesn’t constrain you to use it only with smaller dogs. Relatively convenient, the bowtie attaches itself with an elastic strap and can be removed for hand washing, as it isn’t safe to use with a machine. This comic book themed unit uses a metallic clip, similar to what you might find on an airplane seatbelt, which offers a good medium between sturdiness and convenience. It is ring-adjustable and can fit a number of dogs, depending on the size you purchase, from 9” to 23” inches in neck circumference. Made of nylon webbing, it has prints of the Batman symbol all over its surface, including the interior, so it may be a must-have for the fans of the fictional character, especially as it’s quite affordable, so there’s little risk in later regretting an impulse purchase of this item. This is a collar for a special occasion, but also affordable enough not to make you seem decadent for spending too much to dress up your dog. It is only sized small and medium and should also fit most cats. A red flower is used as decoration, as well as a number of flowery “crystals” throughout its black and white surface, so it might not be discreet enough for day-to-day use, but it will surely make the dog stand out during weddings, house parties, and family events. It closes via a small metal buckle, so it’s sturdy enough not to come loose under your dog’s protestations if the situation were ever to arise. 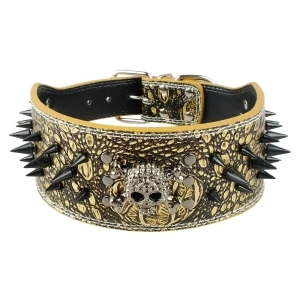 This highly ornate item is primarily intended for aggressive breeds like Pit Bulls or Dobermans, and it’s sure to give your dog a fierce look with spikes all over its surface, and a skull insert on the front. It comes in four colors, one of them an ironically-chosen pink, and it fits sizes from medium to extra large, meaning 17-20 inches to 21-24 inches in circumference. It is made off extra-durable leather and uses a steel buckle to close, so it doesn’t give in to the dog’s antics. Another note regarding safety, the rivets are indeed sharp, so it might not be safe to employ around children. This collar bandana comes in two sizes — small and extra-small, so it’s intended to be used only with diminutive dogs or cats. 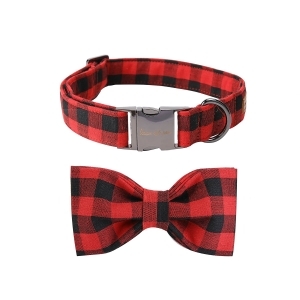 There are heaps and heaps of models to choose from, all of them in leather and plaid, which feature either the bandana above or a fixed bow-tie. The smallest varieties are adjustable to as little as 8.8 inches in circumference at ⅜ inches in width, so they should fit a puppy, while the belt buckle allows for 2 inches of adjustment. The hardware is made out of shiny zinc alloy, so it doesn’t rust and looks particularly nice. There are a lot of new dog products out there, from clothing and dog houses to keep your pooch warm and stylish during winter to GPS trackers so you don’t have to fill the neighborhood with posters if it gets lost. Some owners might be excused if they themselves get lost through all the options available to them, but one purchase should be a no-brainer: the collar. Besides being a necessity during walks this item will also serve to tell other people that your dog actually has an owner and isn’t some stray to be sent to the pound. But what should you really look for in a collar? What features will make it most useful? We’ve taken a look through a number of dog collar reviews to attempt to answer these questions, which is especially necessary right now since dog collars have become increasingly sophisticated lately. You can buy models that protect the dog from fleas, that keep it from developing allergies, help you locate it if it gets lost or simply look particularly stylish around its neck. Things like comfort and size are not to be ignored either, but neither should be ruggedness and the collar’s capacity to hold well over time. If you’re not all that familiar with what to look for, it can give you a hard time to compare dog gifts. Not to worry, we’ve made a short guide with the most important factors to consider, based on what online reviewers had to say. This should be pretty obvious, but always take your dog’s temperament into account when buying things for it. If your animal friend is particularly stubborn, for example, then look into the best dog collars for pulling, which should be resistant enough not to break when your pet is trying to get away from you. A tight fit might also be something to consider in this case since a collar that gets too loose could simply be pulled off by an agitated dog. Also look for these things — durability and tight fit — if you plan on leaving your dog tied to a poll for any significant amount of time. If your dog is especially obedient you might consider rewarding this by paying special attention to comfort, which a loose fitting collar made out of soft material will provide, over durability. 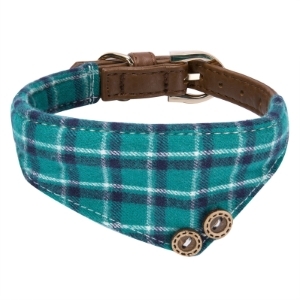 There are almost always multiple sizes to choose from for each model and collars tend to be highly adjustable. Leather varieties come with buckles and slits while fabric ones will usually feature a clip through which you can pull excess material. How tight you will be fitting the collar is up to you and correctly reading your dog’s reactions. Almost all animals will tend to protest if they feel choked so getting the correct adjustment shouldn’t be that much of a problem. Leather is always a favorite, due to its handsome looks and good durability. It holds out well to extended use and can stand up to a significant amount of force before giving in. What to look for if you don’t want to have any unpleasant surprises is that both the buckle and the leash ring are held firmly in place, since these are the most common breaking points. Fabric might not make for the best dog walking collars material but these are a cheaper alternative if you don’t plan to put the item through much use. Most of them will hold out well for a couple of years but once they show signs of wear they are quick to break. Lightweight and highly adjustable fabric will make for a better option for small dogs or for puppies, who tend to grow fairly fast. As we’ve mentioned, this category is pretty extensive since there is a wide variety of products available for sale. One of the most useful gadgets to have attached to is a GPS tracking system. The best dog collar GPS systems can keep tabs on up to ten dogs simultaneously from distances in excess of eight miles. They can also give vocal warnings and display useful data, such as your address so people will know where to return the dog to if it happens to get lost. A flea collar is already a popular gadget, but some newer models also come with anti-allergenic properties, which is a good thing to have if you know your dog to be especially sensitive. 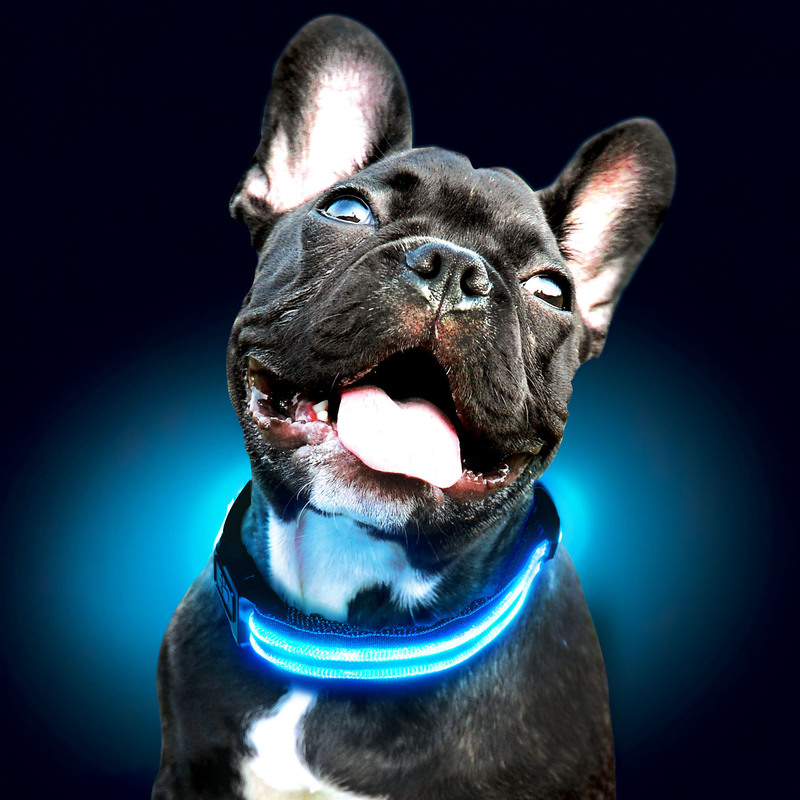 To keep the pooch safe at night you might want to consider investing in a lighted collar, which can be found both with LEDs and neon for the cyberpunk enthusiast. 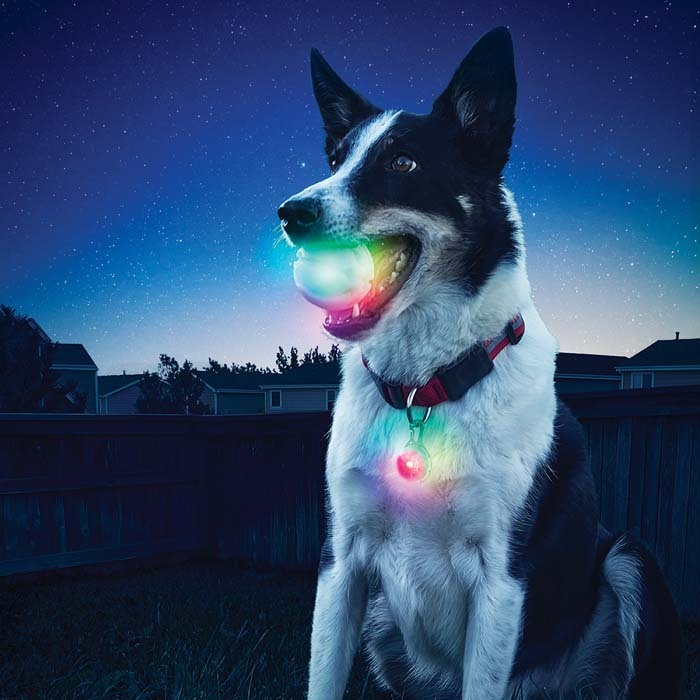 If the comfort of your neighbors is a top priority then a bark deterrent collar might be right for you. This works by detecting when the dog is barking via a built-in microphone and then releasing a harmless high pitched tone — inaudible to humans — that would draw the dog’s attention, taking his mind off barking. For big or aggressive dogs a so-called “super collar” might be the right idea. This is a heavy duty piece of kit that features its own retractable leash, which eliminates the risk of the thing breaking around the metal ring that is generally used for holding to the leash. USB drives get embedded into just about everywhere nowadays, and dog collars are no exception. You can buy a collar that lets you carry some data around if you want to. If Hollywood movies are any indication, the likelihood of meeting a special someone while walking your dog in the park are especially high. Your dog will most definitely not care about style but your potential love interest might. It’s always good to be prepared to display your aesthetic sense for one of these chance encounters and a stylish dog collar is bound to let others know that you are a refined individual, who puts great care even into little things, like dog collars. Leather might work best for this, especially if it has any sort of pattern. There’s quite a lot to choose from here, although the more pretentious handcrafted models might cost you a fair buck. 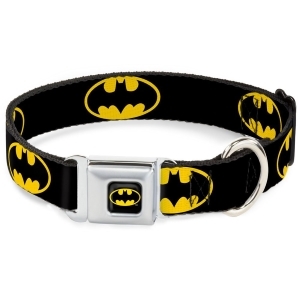 You might even want to match the dog collar with one of your own outfits, which will also serve in underlying the connection between you and your pet.